At 4:15 p.m., the murmurings of a small group in the Honors Commons faded. Slowly, the shuffling stopped. Tapping feet grew still and quiet. Even the breathing deepened, giving way to the deafening and inconsolable silence. The man on everyone’s minds was Austin Tice, a UH alumnus and overseas journalist who disappeared in Syria in 2012. The Cougar editor in chief Cara Smith opened the event by reading excerpts from some of Tice’s last Opinion pieces he wrote for The Daily Cougar. Honors College professor Ted Estess called for a minute of silence for Tice, and poetry readings from Honors professor Robert Cremins and Director of the Arab Studies program Emran El-Badawi rounded out the introductory speeches. “That which we, every day, take for granted — the capacity to speak freely to our loved ones — that is what has been denied to Austin,” Estess said. 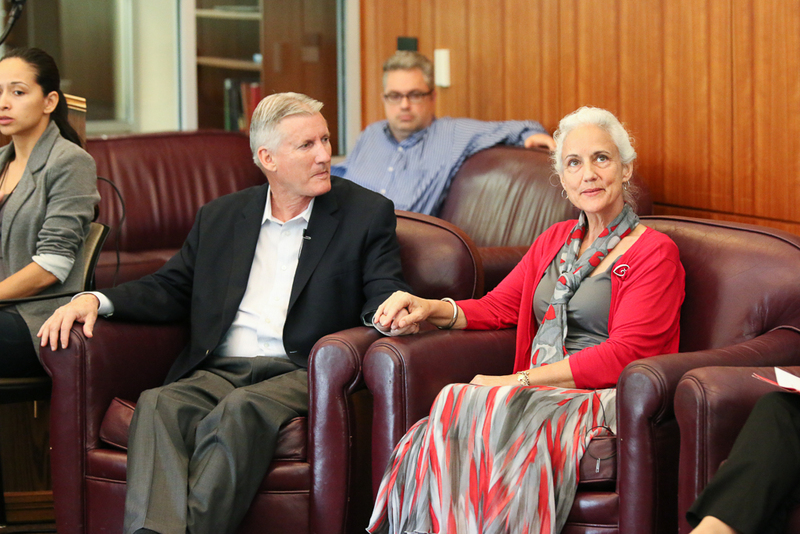 After, journalism professor Lindita Camaj — herself a former foreign correspondent — spearheaded a discussion on journalism abroad with Tice’s parents, Debra and Marc Tice, and the United States Director of Reporters without Borders, Delphine Halgand. “Are you sitting down, Mr. Tice?” the official asked Marc over the phone. Tice grew up in Houston and ventured into journalism with only a decade of children’s wisdom, writing a letter to a nature magazine about a bird he watched with his mother. Years later, Debra tenderly remembered how early Tice realized he wanted to be a writer. Austin attended UH for a year and reported for The Daily Cougar. He came to UH at 16 after being homeschooled and created a second home for himself in the Honors College. Estess, who founded the Honors College, grew fond of Tice during that time. When the civil war ripped through Syria, Tice, who had visited the Middle East before during his time as a U.S. Marine, felt sources on the ground weren’t capturing a grand enough picture of the culture or war. Uncertain that all the facts were being shared, he picked up the burden himself. The thing that’s going to change for journalists is that we begin to develop an appetite for real news. We will not tolerate that they are silenced. We will not tolerate that they are captured, because we want what they serve. Reporters Without Borders, the non-profit where Halgand defends speech and the press, has pegged Tice as the headlining case of the foreign and war correspondent’s plight in the modern day. Halgand estimated that around 40 journalists have been captured in the last year, especially in war-torn countries like Syria, Libya and Ukraine, and that 180 were imprisoned all over the world. But Halgand stressed that the greatest volume of victims aren’t usually Americans like Tice. Local journalists, she said, account for nearly 90 percent of the victims of kidnappings and free-speech violations. “When journalists are missing, we are all blindfolded,” Halgand said. Now, a campaign to raise awareness for Tice thrives. All are encouraged to sign a petition to the U.S. government, encouraging it to take action on Tice’s behalf. The family also encourages supporters to participate in their social media campaign, where users take a picture of themselves blindfolded and upload it to their social media account using #FreeAustinTice. The act symbolizes the blindness and disjunction people would face in a world where journalists are allowed to be silenced. CORRECTION: Delphine Halgand’s name was misspelled as Halgard in a previous version.